If you are as old as me and grew up in England you will be very familiar with the phrase “through the square window”. This was the time of day I loved. Just home from school, sitting with a snack in front of our tiny TV watching Play School on BBC1. Every episode you were transported to a factory, farm or shop to see the process of something being made “through the window”. Toothpaste, jaffa cakes, books, bicycles, packets of sweets. 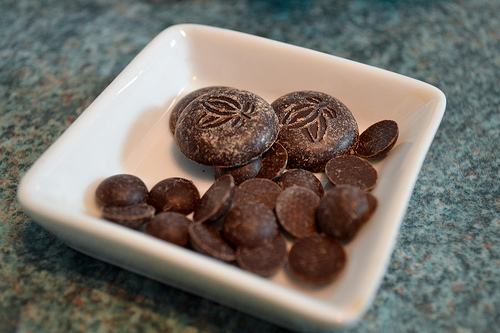 These memories came flooding back when I met up with Katie Chistoffers at Matcha Chocolat HQ. As well as a tasting of her gorgeous Valentine’s Day Limited Edition range she kindly took me through how her wonderful artisan chocolate is made. First we talked about the couverture. 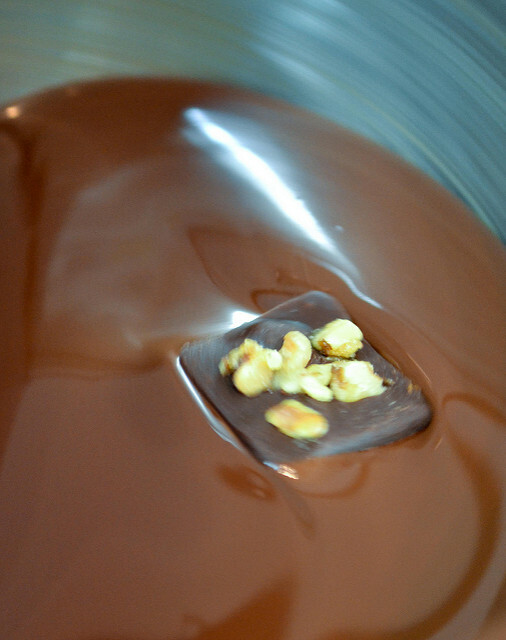 This is the base chocolate that’s used for the outside shell and for the ganache filling. Katie has a variety that she uses from Madagascar, Sao Tome and Bolivia because she believes passionately that the flavours of these must complement the flavours of the fillings. Speaking of which, she started with pairing fine teas from Japan, China and India with chocolate but her range now encompasses other wonderful botanicals including spices, herbs, fruits and flowers. The flavours were inspired by her homeland. Katie is from Connecticut where there are many varieties of Sourdough Bread. Katie recalls a Walnut, Rosemary and Raisin Sourdough and thought the flavour combination would work well in a chocolate. 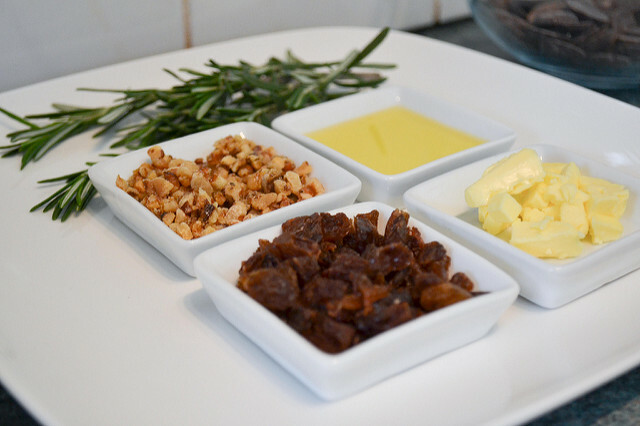 I could understand how the raisin and walnut would go in but was intrigued by the rosemary. If I were to bake a loaf of this I would simply add sprigs of the rosemary on top of the bread and that would be sufficient to draw the flavours out. First off she made the ganache using an equal proportion of whipping and double cream. She heated this with chopped rosemary and then allowed it to steep to let the flavour infuse. Of course! This is exactly what I do when I make Lavender Cakes. She pounded the rosemary further in a pestle and mortar to get more oils out. She then added walnut oil to the cream which would add to the caramelised chopped walnuts used later to give the rich walnut flavour. 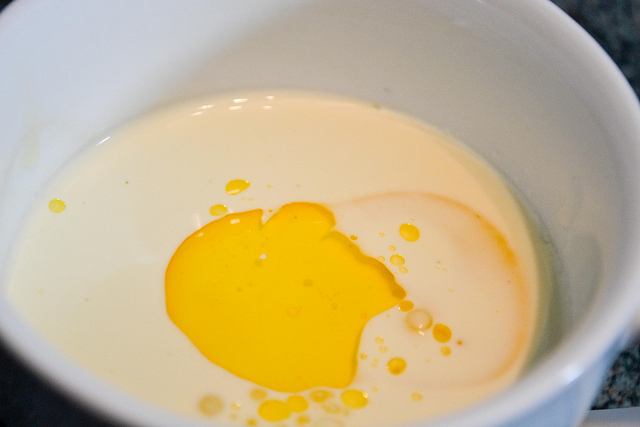 This was mixed with melted chocolate, butter raisins then left in a lined container at room temperature to set. I couldn’t believe this tiny container would yield a box of chocolates! 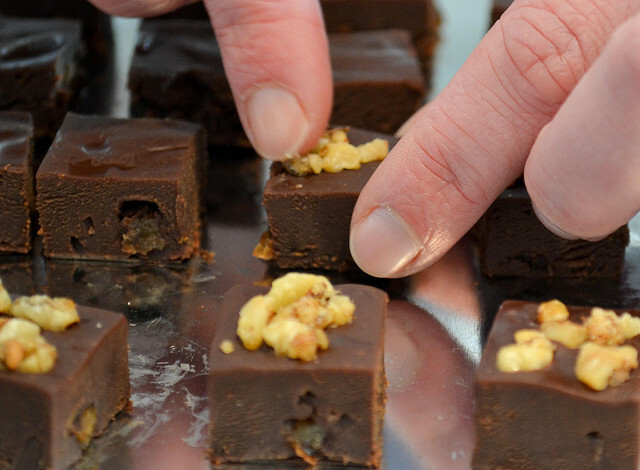 Once the ganache was set, she cut it into 16 squares and then placed nibs of walnut on top and lightly pressed them in. She moved on to tell me all about tempering. She gave a very in depth and scientific explanation (she used to be a Biologist) and I must admit it went above my head so I’m taking this verbatim from her in depth blog post on the subject. 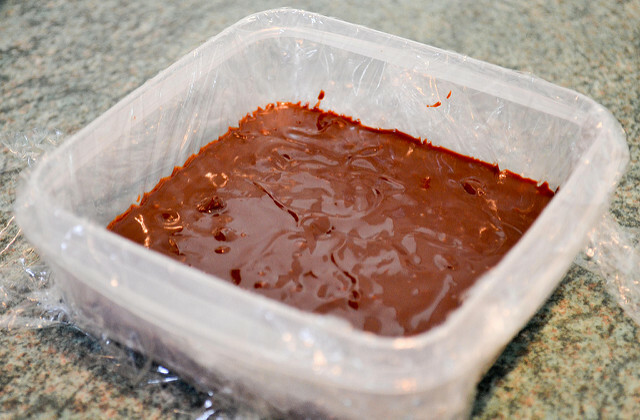 Katie tempers only occasionally by hand nowadays and gave me the tip of transferring the melted chocolate from one bowl to another bowl as a cold marble slab is not kitchen equipment I have. You are basically just trying to cool the chocolate down. She uses a machine which works and brings the chocolate to the right temperature. 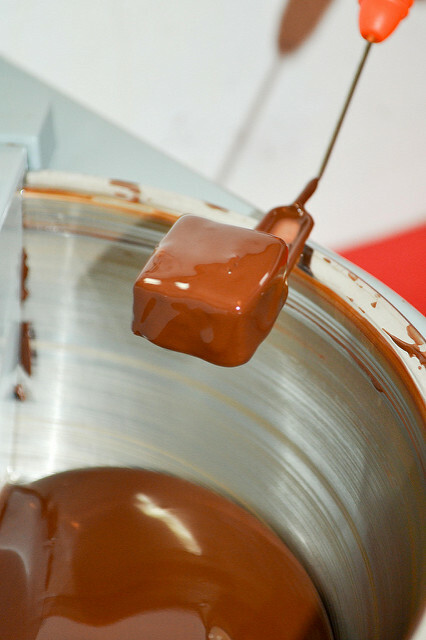 Once it is ready, the squares of ganache are dipped in and then pulled out using a prong like instrument. And that really was it. She left these to cool and by the time she’s tidied up they were set enough to package up for me to take home! Rosemary, Raisin and Walnut Chocolate ready to eat! It really was a wonderful day of learning for me. I came back enthused, excited and creative. I also came back inspired by Katie’s infectious enthusiasm for her craft. 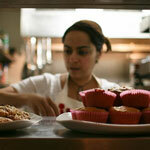 she really is a perfectionist seeking to use only the best ingredients and make the freshest chocolates. I’m excited to see what the future holds for her and wish her every success. She’s a true botanical artisan. sounds delicious, makes you want to get right on and make chocolate! Yep! It sure does. She made it look so easy but I know it isn’t! 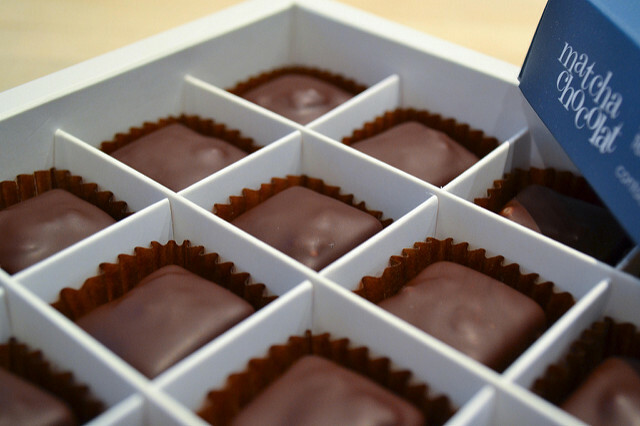 Oh my goodness what a wonderful post – I love seeing the chocolates form and develop through the stages. I would look thorugh my window at these any time.